So let me tell you a little story. Once upon a time, when I was a college student, I took a hybrid online course. It involved participating weekly in discussion boards on Blackboard, turning in papers online, and coming to one brick and mortar class meeting, where we were to give PowerPoint presentations on our final papers. There were two things that stood out to me as I took this course. First, the amount of work in this course was substantial. There was more reading and writing than in any of my on the ground courses, and the discussion board assignments were a snooze. The second thing that stood out to me was the complete lack of connection with my classmates and my professor. I had no clue who any of these people were or what they were like, other than some perfunctory text comments on Blackboard or in the margins of my papers. So when the final day of class arrived, I was excited to finally have some kind of real interaction with my classmates. Unfortunately, that was not to be. We sat at our desks, the professor gave a brief and monotone explanation of how the presentations would work, and we got started. One after the other, we presented fairly boring PowerPoints, while the professor nodded off in the back of the room. Yes, nodded off. But we were so disengaged from the course at that point that we didn’t really care. We went through the motions of completing our presentations, all got a perfunctory A, and I never saw or spoke to the professor again. Those numbers are dismal. And how about this? When I actually delved into the report, though, I found some interesting things. If the goal here was to determine what faculty think about the kind of online learning I experienced as a student, then sure. These numbers make sense. But that’s not the whole of “online learning.” First, and most importantly, Inside Higher Ed has lumped all online learning together. Survey participants answered the questions based on their evaluation of ALL types of for-credit online learning: MOOCs (yes, some MOOCs offer credit), asynchronous courses, synchronous courses, blended/hybrid courses, and synchronous, webcam-enabled learning (what I refer to as SWEL) courses. This is a massive range of educational settings. Just because they’re all online doesn’t mean they’re interchangeable. There is simply no comparison between the online courses I teach and asynchronous online classes at a for-profit college, and to lump them together is severely misleading. Further questions ask if faculty have integrated lecture capture, but not if they’ve taught live, collaborative online courses; the omission displays a misunderstanding of the methods that leading online programs are using, which I have detailed in a previous post. Additionally, one of the survey items asked “In your opinion, should institutions work with online program management companies to produce online degree programs, or should they primarily produce their own?” The fact that the majority of respondents indicated that institutions should produce their own degree programs shows a severe lack of understanding around what it takes to create a truly high quality online program. Our model, which allows the faculty to retain control of content and instruction, but partners with a private company (in our case, the brilliant and groundbreaking 2U) to produce, develop, and manage the technology, is highly effective. It also prevents me, as a faculty member, from having to spend all of my time updating the website, and allows me instead to focus on instruction. And noticeably absent from Inside Higher Ed’s writeup of the report is a discussion of this interesting bit of data. 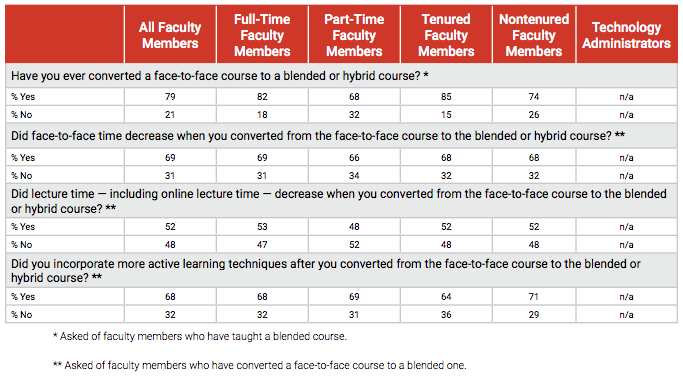 Note that half or more of the respondents indicated that moving to a blended or hybrid course caused them to decrease lecture time and increase active learning techniques! That’s fantastic! Even if the course isn’t a SWEL course, moving to active learning from lecture is a move in the right direction. No. This model of higher education will CHANGE traditional faculty roles. AND IT SHOULD. If the traditional faculty role is standing in front of a room of 300 students and lecturing in a monotone for an hour, then good riddance! So what is there for progressive online educators like myself to take away from this data? First and foremost, that we need to do a better job of getting the word out about what we’re doing. I’m shouting from the rooftops, but I’m only one person. There are hundreds, if not thousands, of faculty around the world that teach in SWEL courses, that use robust, high quality instructional methods, and that achieve high educational outcomes for diverse populations of students. 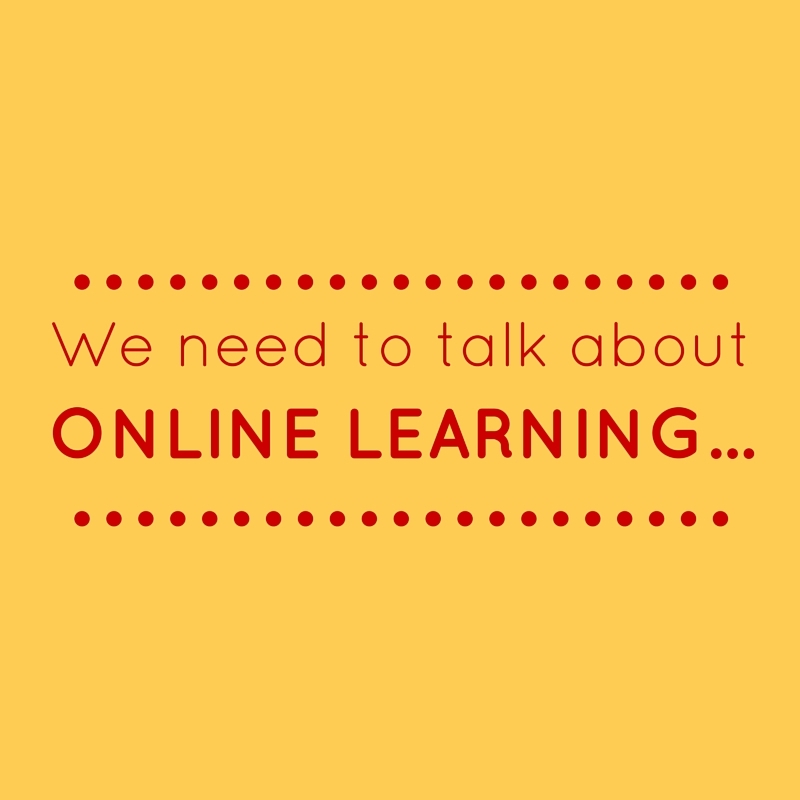 We need to be a strong, clear voice in the discussion on online learning. Do you teach a synchronous, webcam-enabled course? Share your information below to connect with other educators like you, and get our collective voice heard! What synchronous, webcam-enabled online course(s) do you teach? Previous Post Yes, actually. I AM a teacher.